Andy Friend conceded he was taking a risk by rotating his squad for this European Challenge Cup quarter-final and the Australian learned a harsh lesson at the AJ Bell Stadium. Connacht have made progress in year one of the coach’s stint in charge, but their squad depth remains some way off being able to cope with fighting on two fronts at the business end of the season. And, despite resting a host of his leading lights, he leaves Manchester with fresh worries after losing Ireland internationals Jack Carty and Finlay Bealham to injury. Carty was replaced early in the second-half with a suspected bicep injury and, while Friend was relatively upbeat about his prospects, Bealham came off with a serious hand injury in the closing stages and looked in considerable distress before being taken away to hospital. Both players would be major losses if ruled out in the coming weeks as Connacht go in search of their number one goal. Despite the fact that a place in the Challenge Cup semi-final might have guaranteed them Champions Cup qualification next season if results went their way, the Guinness PRO14 is clearly the priority. 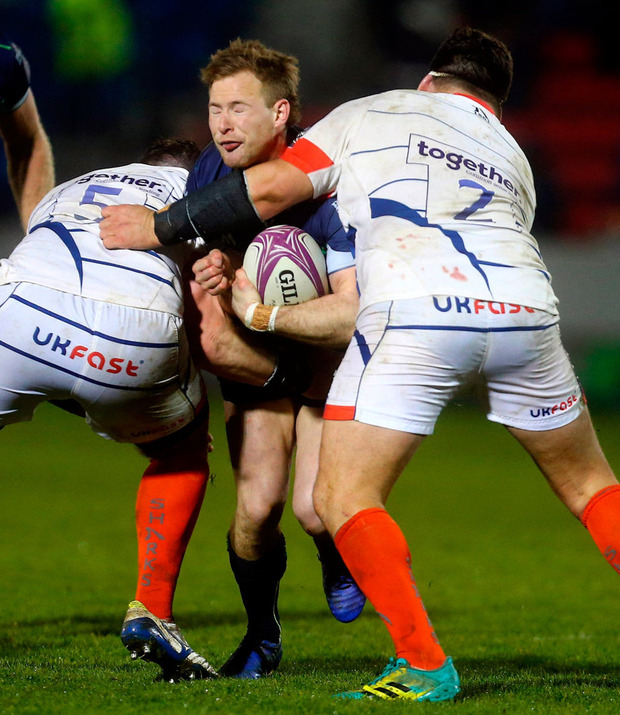 Friend chose to rest a number of front-liners and paid the price as a Sale Sharks marched into the semi-finals on the back of a strong first half. If they keep their place in the top three of Conference A, it will have been worth it, but they’ll need more depth to cope in two competitions next season. Without their first-choice tight five, the Irish province wilted in the face of Sale’s brute force as the damage was done before half-time. The Premiership side bullied their guests from minute one, with South African centre Rohan Janse van Rensburg rampant, and after winning the collisions they enjoyed space in the wide channels for their blistering wingers. When Connacht had the ball, they couldn’t deal with Sale’s line-speed and Bundee Aki was strangely subdued last night. It might have been different had they been more clinical in the opening minutes when Carty read Faf de Klerk’s mind and picked off his pass on the edge of his ’22. The Ireland out-half raced clear and made it into the ’22 before Denny Solomona finally tracked him down, but Carty’s pass to Kyle Godwin died in the air and the Wallaby couldn’t hold on. Carty did give his side the lead with a seventh-minute penalty when the Sale defensive line crept up offside, but it wasn’t long before the visitors were behind. After Cian Kelleher was held up in a choke tackle off the restart, the men in white attacked wide right. Niyi Adeolokun misread the move and compounded his error by slipping which left Byron McGuigan with room to finish a well-worked move in the corner. AJ MacGinty converted from the touchline and it wasn’t long before he was lining up another effort after Solomona crossed in the right-hand corner. This time, the English side blitzed the under-powered Connacht scrum and worked a fine move off the lineout once again. After they were held up, they took it through a couple of phases before spotting an overlap for the England international to cross and when MacGinty added the extra points the home side led by 11. The Irish province needed a big moment to release some pressure and their biggest star, Bundee Aki, delivered with a strong breakdown poach that relieved a long spell under pressure, but they went through a series of attacking phases without going anywhere before Carty kicked dead. He made up for it with a raking kick in behind that helped establish field position but, when Jono Ross was penalised for not rolling away at a ruck, the Athlone native pulled his effort off target. MacGinty made no such mistake when he punished Darragh Leader for holding on under pressure, before Eoghan Masterson’s lazy run handed him another penalty in front of the sticks and he obliged. As half-time approached, Friend’s side found themselves 17 points down and losing Carty didn’t help matters. When they finally got themselves a kickable penalty, they turned down the points only for Godwin to badly miscue his touch-finder. They got a lifeline when second-row James Phillips led with his elbow and connected with Godwin and was sent to the sin-bin. It took nearly eight minutes, but Connacht finally made their man advantage count as they turned down another shot at goal and backed their much-changed scrum. The pack marched forward and put Sale on the back foot, allowing Godwin to take the ball to the line, beat his man and power over. Darragh Leader took over the kicking duties and made it 20-10. 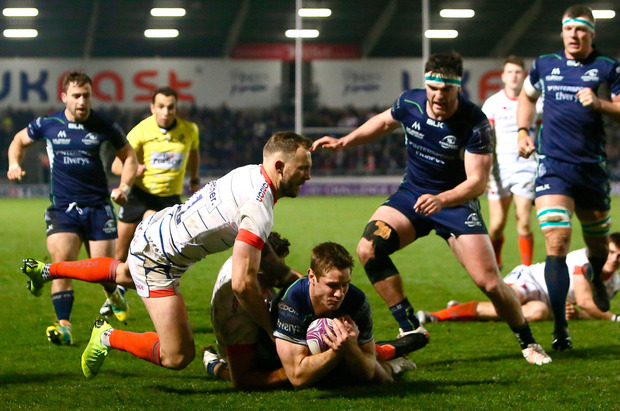 Suddenly, it was Sale making the errors as – led by their bench men – Connacht poached a couple of lineouts and began getting over the gainline on a regular basis. Despite their late ascendancy, they couldn’t get any closer on the scoreboard despite Leader’s long-range attempt at goal. 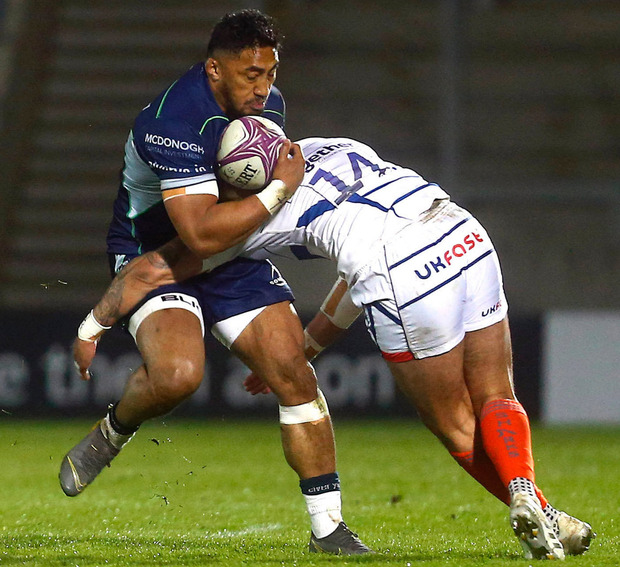 Sale Sharks – L James; D Solomona, S James, R Janse van Rensburg (C Redpath 6-16), B McGuigan; AJ MacGinty (C Redpath 80), F de Klerk; R Harrison, R Webber (C Langdon 60), J Jones (A Tarus 62); B Evans, J Phillips (J Strauss 70); J Ross, T Curry (B Curry 49), J Beaumont. Connacht – D Leader; N Adeolokun (S Fitzgerald 54), K Godwin, B Aki, C Kelleher; J Carty (T Daly 46), K Marmion (C Blade 60); P McCabe (D Buckley 63), T McCartney (capt) (D Heffernan 60), D Robertson McCoy (F Bealham 27); J Cannon (J Maksymiw 60), G Thornbury (J Maksymiw 42-47); E Masterson (R Copeland 54), J Connolly, P Boyle. Next articleWOW Air Explainer: What can I do if my flights are cancelled?